Kissing Crane Yellow Medium Hunter Knife | BUDK.com - Knives & Swords At The Lowest Prices! 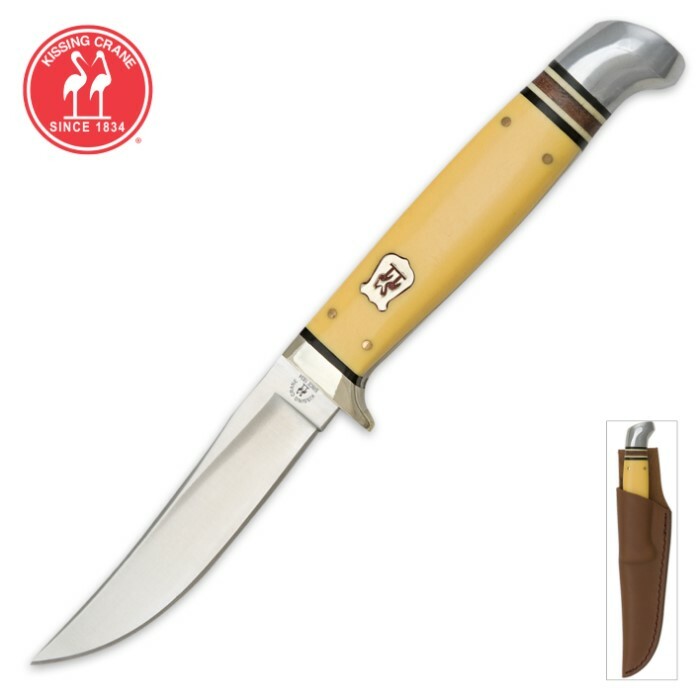 Kissing Crane is proud to introduce these full-tang, fixed-blade Hunter Knives, offering classic Kissing Crane quality and style in an elegant and functional hunting knife. I bought both the Boker Air Force & K.C. Yellow Medium. Both well made, but the K C handle is longer & provides better grip. Boker shinier, but the K C looks like it has a patina. The K C blade is shorter, but just feels right. Next I'm going to buy the K C Black. Excellent sheaths on both knives. I Bought mine from a man who wanted A larger / blade . He came to my sale with his & asked $ 15.00 for it . I gladly bought it. It is a great knife , NOT too big and Deffinitly not too small THe knife is NOT for sale now ,NOR do I percive it ever being for sale.